Hello you may have hopped over to me from Jo and seen the lovely project she has done or you have just joined the Blog Hop with me. My first project is a notebook. I made this on a summer retreat this year but decided to use the ‘Under the Mistletoe DSP, Real Red and Old Olive card stock, with a scrap of Basic Black. The covers are cut from mounting card, covered in the DSP and finished off using Real Red card stock. 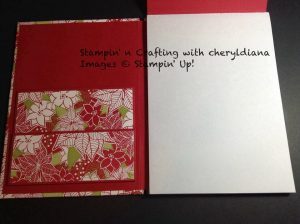 Two pockets were made for the inside front cover using the Real Red card stock and decorated with the DSP. 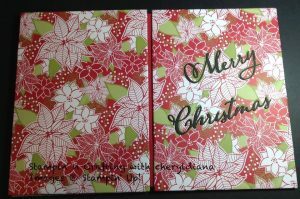 The outside front cover was decorated using Basic Black and Old Olive card stock. 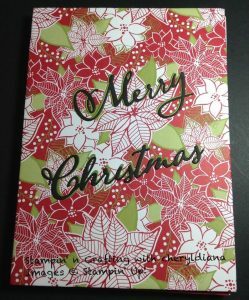 The Merry Christmas was die cut using the Merry Christmas Thinlit Dies from the Autumn/Winter catalogue. My second project is a curled paper wreath. This is an easy project but looks very effective. For this project I used a 25cm polystyrene wreath, dressmaking pins and one pack of Under the Mistletoe designer series paper. First I chose 3 suitably patterned papers from the DSP pack. Each of the 6 sheets were cut into 25cm x 1.5cm strips. 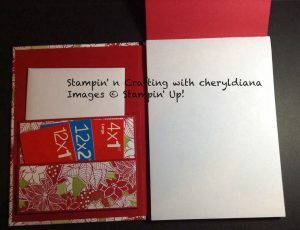 These were then folded in half and curled using the Stampin’ Up! bone folder. A dressmakers pin was pushed into the fold of the strip and pinned into the wreath. 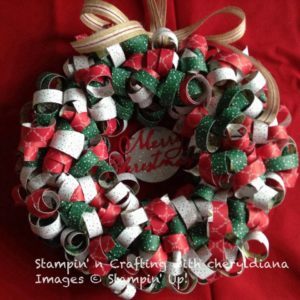 The middle was a circle of Silver Glimmer paper and again using the Merry Christmas Thinlit Dies Merry Christmas was cut out of the Real Red card stock and fixed to the wreath. To finish it off a loop and bow was attached. Love your projects! Thanks for sharing.